Hepatitis C but don’t know it. to know if you should get tested. 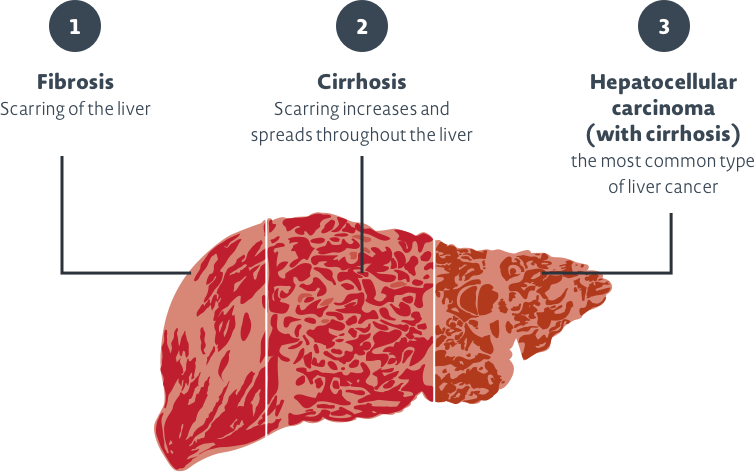 ‘Hepatitis’ is a general term for inflammation or swelling of the liver. ‘Hepatitis C’, also known as ‘hep C’, is inflammation of the liver that results from infection with the hepatitis C virus. The liver is one of the body’s most important organs, performing many vital functions which are essential to good health. Most people who live with hep C have no symptoms and are not aware that they are infected, so over many years, the virus can cause damage to the liver which can lead to serious health problems. The hepatitis C virus is highly contagious and is spread when even a small amount of infected blood from someone with hepatitis C comes into contact with your blood. Infection can occur if you’ve been tattooed or had a body piercing with contaminated equipment or ink, if you had a blood transfusion in New Zealand before 1992, or if you’ve shared needles for injecting drugs – even once. Hep C can be transmitted in many other ways and it’s common for people not to have any symptoms. If symptoms do appear, they can be mild and vague, including tiredness and fatigue, joint pain, loss of appetite, nausea and abdominal pain. We’ve put together a checklist of risk factors and symptoms to help you to assess whether you should get tested for hep C.
The only way to know if you have hepatitis C is to get tested. It takes one or two blood tests to find out. Getting diagnosed and treated early can help reduce your chance of serious liver damage and other health problems that may be caused by the virus and keep it from spreading to someone else by blood contact. If you think you should be tested, see your doctor so you can know for sure and discuss possible treatment. If you have been diagnosed with hep C, taking care of your overall health, including your liver health, is important while you’re working with your doctor on treatment. It is also important to know how you can prevent the transmission of the hep C virus to another person, as well as knowing how it is NOT spread. Treatments have advanced considerably and most people living with hep C now have the chance to be cured of the virus. You are considered cured when no hep C virus is found in a blood test taken 3 months after treatment has finished. As with all treatments there may be side effects. Your doctor will advise what’s best for you. Your doctor is the best person to talk to if you have any questions about hepatitis C, if you want to get tested or discuss treatment options and how to stay healthy. You can use the hep C checklist which includes risk factors and symptoms together with some suggested questions to ask. the information provided on this website should be used as a guide only. it doesn’t replace the advice of your doctor. Gane E. N Z Med J 2014; 127:61–74. Centers for Disease Control and Prevention. Hepatitis C General Information. www.cdc.gov/hepatitis/HCV/PDFs/HepCGeneralFactSheet.pdf. Accessed March 2018. National Library of medicine. How does the liver work? Hepatitis Australia. Hepatitis C. Transmission. www.hepatitisaustralia.com/hepatitis-b-facts/transmission Accessed March 2018. Bpacnz The treatment of hepatitis C has changed. BPJ 2016;77. www.bpac.org.nz/2016/hepc/docs/hepc.pdf Accessed March 2018. Centers for Disease Control and Prevention. Hepatitis C FAQs for the Public. www.cdc.gov/hepatitis/hcv/cfaq.htm Accessed March 2018. Hepatitis Foundation of New Zealand. www.hepatitisfoundation.org.nz/. Accessed March 2018.
WHO. Hepatitis C. Fact sheet. October 2017. www.who.int/mediacentre/factsheets/fs164/en/ Accessed March 2018. NHS. Hepatitis C Lifestyle FAQs. www.nhs.uk/conditions/hepatitis-c/living-with/ Accessed May 2018. Ishida JH et al. Influence of Cannabis Use on Severity of Hepatitis C Disease. Clin Gastroenterol Hepatol 2008; 6(1): 69-75. Esfeh JM. Ansari-Gilani K. Steatosis and hepatitis C. Gastroenterology Report 2016; 4(1): 24-29. The content on this site is intended solely for New Zealand residents. It is intended for informational purposes only and should not be used to replace a discussion with a healthcare professional. All decisions made regarding patient care must be handled by a healthcare professional and be made based on the unique needs of each patient. The person shown is from stock photography (model) and is not an actual patient. This website has been developed and is funded by AbbVie Limited, Wellington. TAPS PP2088. NZ-HCV-0168. Date of Preparation June 2018. If you can’t find what you are looking for the best person to talk to is your doctor. You are now leaving the Hep C New Zealand website. Links to external websites are offered for your convenience. References to any products, services or other information by trademark or otherwise is not intended to imply endorsement by AbbVie Limited. Any healthcare information provided within these sources should be discussed with your healthcare professional and does not replace their advice.